Product Update: Opportunities - Who Doesn't Like a Good Queue? Product Update: Opportunities – Who Doesn’t Like a Good Queue? Here are the latest Adzooma updates. Explore our new interface option, new opportunities and find out how to join the Adzooma Early Access Programme. Product Update: Who Doesn’t Like a Good Queue? Barely a week has passed since the last product update but already there is plenty to tell you. 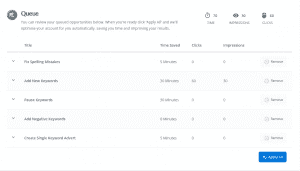 It’s been a busy few days since the roll out of Support for Multiple Advertising Accounts (“Agency”) and a big update to our Opportunities feature has just gone live. Since launching support for multiple Google Ads accounts on January 14th, we’ve had a great response from users. In its first week, we’ve seen the addition of many new accounts. In addition, Monday saw the launch of our Early Access Programme for PRO and Agency users. This programme is an exclusive group of users who gain early access to new product features and improvements. They also get priority support, preferential offers and discounts. As part of the programme, users provide feedback on product improvements and new features through our dedicated online feedback portal and Slack channel. The Early Access Programme already has many new users who are highly engaged and have provided valuable feedback. Being a core feature of the Adzooma platform, opportunities get worked on constantly. This week saw the launch of several new opportunities and a new interface for managing and applying opportunities for more advanced users. The card-based interface of our opportunities has always made it quick and easy to action changes. Over two-thirds can be done with just a single click of a button. Now it’s even easier. Our new interface allows you to view, sort, filter and organise your opportunities thanks to the new “Queue” view. In this view, opportunities are grouped by category and can be sorted by their projected impact (impressions, clicks, conversions, spend and so on). It also provides the user with more time to plan the optimisations they want to make. Once the user is happy, queued opportunities can be applied with a single click. Adzooma will now automate the process of creating mobile-only campaigns. This is suggested where a campaign has high potential on mobile devices. This allows a user to create a campaign that targets only mobile devices. The original campaign remains when this opportunity is applied but is opted out of mobile. Over time the number of keywords in an ad group can grow. This results in a decrease in the relevance of the ad copy. With a Single Keyword Ad Group, only one keyword of a particular match type is added to the ad group. This means that the ad copy can be highly targeted. Opportunities will suggest creating a Single Keyword Ad Group. This will automate its creation for an account’s highest volume and best converting keyword. Even though Adzooma is an advertising platform, the job of optimisation doesn’t stop at the ad. A slow loading or poorly performing landing page can have a huge impact, decreasing your conversion rate and pushing up your advertising costs. For retail users specifically, studies have shown that conversion rate drops on average 20% for every second of delay. With this in mind, Opportunities will now alert users to landing pages that are slow loading. Whilst it’s not possible to action this opportunity automatically, it does provide another layer of suggestions that users can use to optimise their accounts. Mid-February will see the launch of a brand new feature: Automations. Using this feature users will be able to define rules which when matched will automatically trigger actions on their account, such as pausing campaigns and adjusting bids. Automation is a new core feature of the platform that will help us on our way to becoming a truly powerful optimisation tool.